Smoothies are a great way to get your healthy fruits and veggies, but many are loaded with sugar! If you are diabetic, you know that’s not best for your blood sugar. 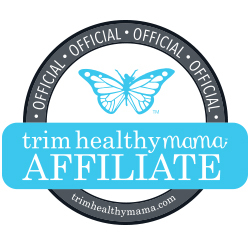 If you’re a Trim Healthy Mama, you probably know that starting your mornings off with a sugar-laden smoothie is a great way to set you up for a crash later (and tighter waistbands). 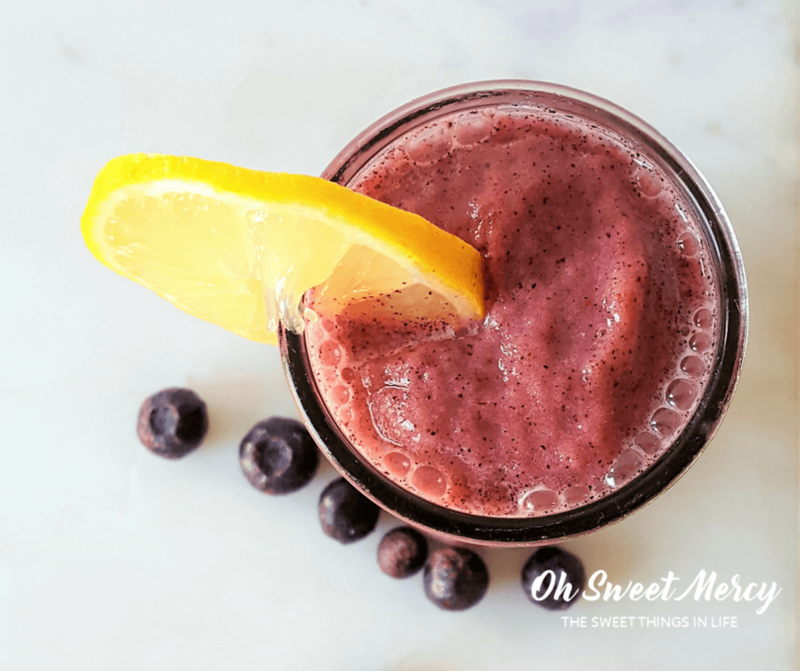 This healthy blueberry lemon smoothie won’t do that! In fact, you might find yourself staying full longer and your blood sugar more stable! That can lead to looser waistbands, too. Whether diabetic or a THM, keeping blood sugar stabilized is essential for good health and conducive to weight loss. I’m going out on a limb here and saying that’s good for everyone, not just diabetics and those trying to lose excess, unwanted pounds. Maybe my headline, promising you a secret, drew you to this post. If you’re a THM you might already know what this secret ingredient is. Sit down first though, because you might be shocked. See that green stuff up there with the pretty blueberries? That is pureed okra. 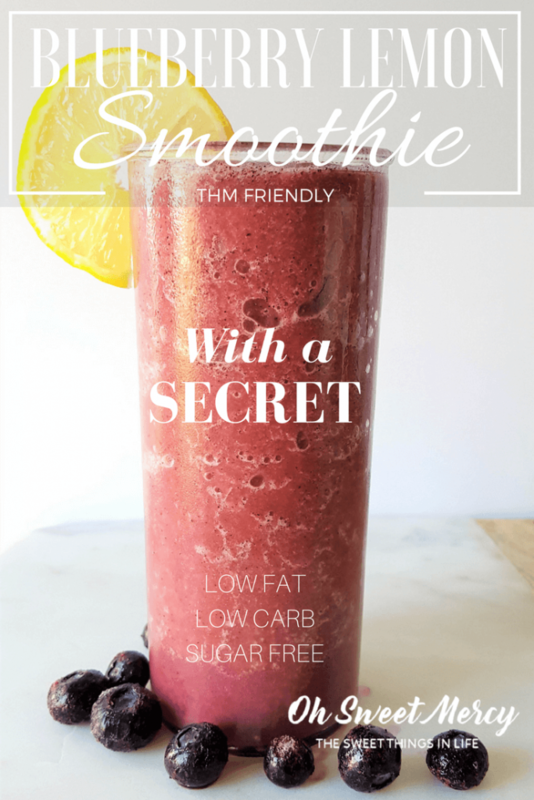 Last year, Trim Healthy Mama came out with their Berry Secretive Big Boy Smoothie (page 416 of the THM Cookbook plus 4 other flavors). THMs across the globe started putting okra in all the things. Even soups, like THM’s Trim Train Taco Soup. I was skeptical. Because okra, y’all. It’s slimy! And tastes…okra-y. Blech. In fact, the first time I made a Secret Big Boy I didn’t really like it. I drank it because it’s good for me and I don’t like wasting food, but it wasn’t my favorite because I could definitely taste the okra. But please don’t let my experience keep you from trying it, lots of THMs out there love their Secret Big Boys! The chocolate version was really good though. Because chocolate, y’all. I’m probably not selling you on the okra, am I? Oh, but do please keep reading. 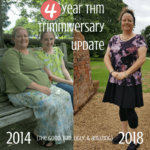 It gets better I promise! Some amazing benefits of okra. Actual studies have shown that okra is beneficial for blood sugar control, as well as being helpful for other conditions. Okra also has been shown to have anti-stress effects, help lower cholesterol, and help combat fatigue. It’s also rich in vitamins (especially C and K), minerals (like magnesium and manganese) and antioxidants (such as beta carotene). Find more nutrition information here. One note of caution, however — if you take Metformin, okra can interfere with how this medication works and you should consult your healthcare practitioner. Let’s put okra in all the things! There’s an “okra challenge” out there that encourages THMs to consume one cup of okra daily. I’ve been wanting to try it but okra…blech. But it’s so good for you! The other day I decided I was going to make a blueberry protein shake and put some okra in it. Because it’s good for me. Turned out that I didn’t have any good protein options for a smoothie (like cottage cheese), so I made it without. Feel free to add a scoop of collagen to your blueberry lemon smoothie for a boost of protein. An on-plan whey protein powder would lend creaminess to this as well. I was honestly surprised at how delicious this smoothie was! Smooth, slightly tart, deliciously berry-ish — it was so good, I’ve been making myself a yummy blueberry lemon smoothie every morning for breakfast. As written, this recipe is a Fuel Pull on the THM plan. That means your healthy, delicious, blood sugar stabilizing blueberry lemon smoothie is low in fat and carbs and will go with any fuel type. It does contain a full serving of blueberries for an S or FP meal, so this would be your carb source. Yesterday, I had an egg white omelette with my smoothie and was very satisfied. In fact, I really wasn’t hungry almost 4 hours later but made myself a small snack anyway. I haven’t been craving junky foods, either. That’s what happens when you put good fuel in your body. Healthy, nourishing foods give your body what it needs so it doesn’t have to cry out in desperation for anything and everything! I also added glucomannan powder to this smoothie. That is optional, but “gluccie” as THMs so lovingly call it also has fiber and blood sugar controlling properties. It also helps your smoothie stay thick longer. But can you taste the okra? Initially, yes, I could taste the okra a bit. But it wasn’t overpowering. Since I was busy making the rest of my meal my smoothie sat there for several minutes before I could really sit down and enjoy it. I found that as it sat, the okra flavor seemed to diminish a bit. You may have very sensitive taste buds that can pick out an okra a mile away. If that’s the case, you may not like this recipe. Those that love the taste of okra or tolerate it well enough, well I think you’ll love it! My blueberries are all gone until grocery day, unfortunately. 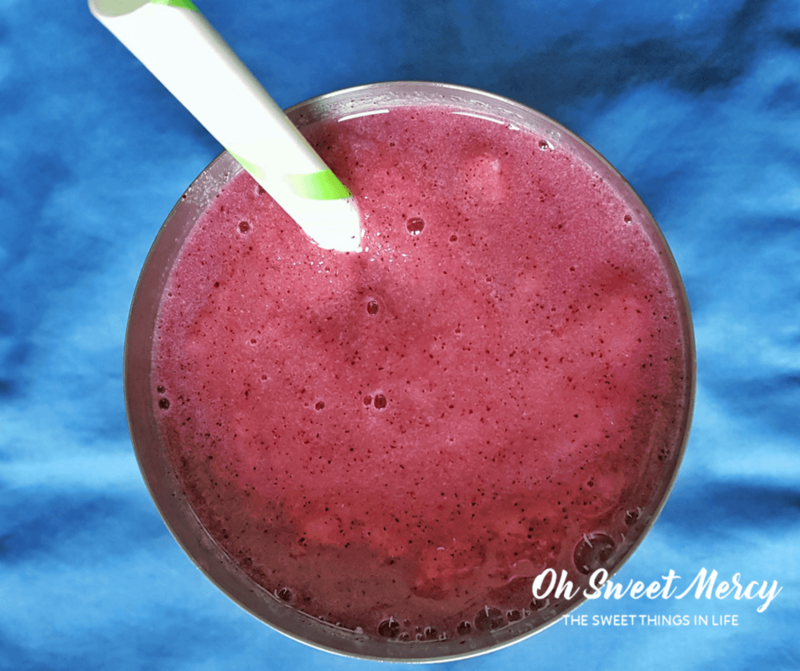 Now I’m craving the bright, fresh flavor of this delicious smoothie! You go on and make one for yourself though, it’s easy! A delicious, healthy, no sugar smoothie that can help you stay feeling full longer and stabilize your blood sugar levels. Add water and okra to blender jar and blend until smooth. 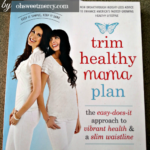 Trim Healthy Mamas this is a Fuel Pull. It does contain a serving of blueberries for an S or FP meal so this would count as your carb source. A high-powered blender does a great job of pureeing the okra smoothly. It took less than a minute in my blender. If you don't have a high powered blender, it may take longer or may not puree completely. The glucomannan powder is optional, but does a nice job of helping it stay thick longer. It also has blood sugar stabilizing properties. 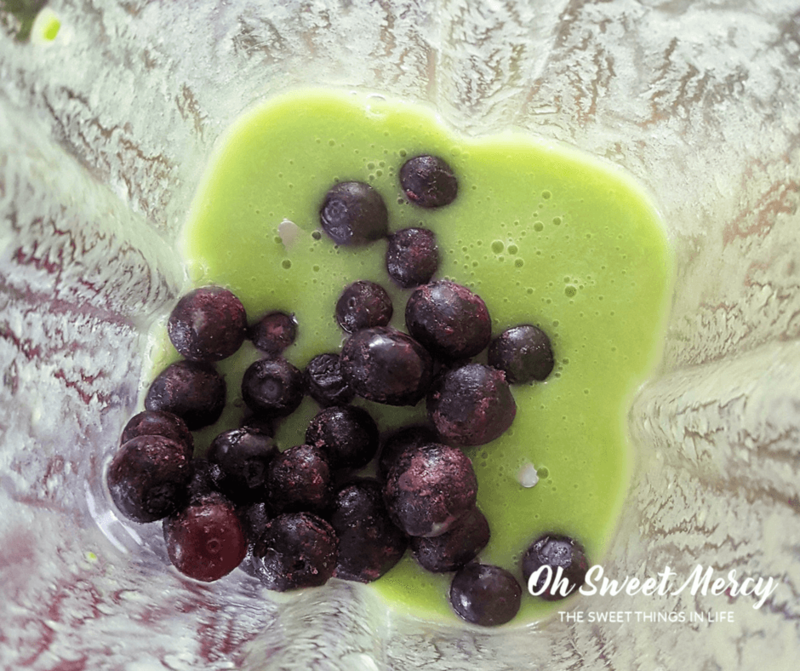 Why not pin this Blueberry Lemon Smoothie recipe to your favorite Pinterest boards? 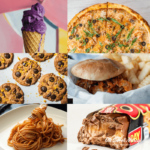 « New Feature: Save Recipes and Create a Shopping List! Thanks Holly! I’m totally addicted lol. 76 yrs old…back on plan with a plan! Restart this morning with this Smoothie. Delicious! Did adjust sweetness with 1 dropper liquid stevia. Have your site bookmarked. Thank you! Hi Judy! So sorry for the late reply, life has just been crazy these last several weeks! I’m so glad you enjoyed this smoothie, it’s one of my favorites too. 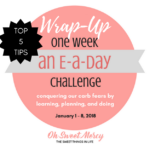 I’m honored that you started back on plan with one of my recipes! May YHWH bless you as you continue on tbis healthy path! As written, this is a FP. Keep in mind that it does contain the full amount of blueberries for an S or FP setting. So, it makes a great snack on its own (maybe add protein powder or collagen for more protein), or a (big) dessert after an S meal with no other carbs at all in the meal (like meat and nonstarchies only). It would also be fine in an E setting, you’d just need more carbs to actually make it an E if this was the only thing you wanted to have.